The handler of most events as the Event-Catcher with variety of advanced Actions for service of your projects and libraries, the build processes and processes at runtime from Visual Studio and MSBuild Tools. 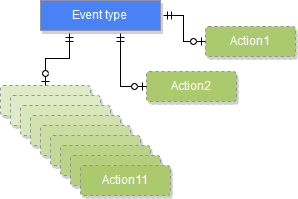 Ability to handle events for all subprojects at once in solution as Solution-Events or individually for each project. Supports additional MSBuild & SBE-Scripts engine for advanced usage. Install [?] 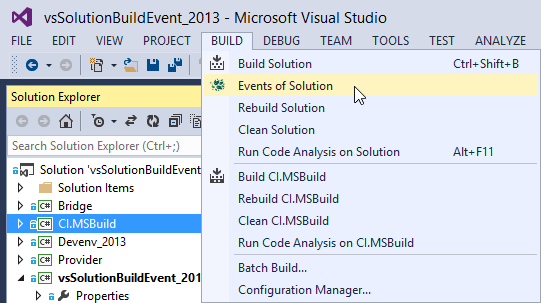 latest buildvsSolutionBuildEvent.vsix and restart your VS IDE. That's all. Where '...' - is any allowed syntax with MSBuild data. 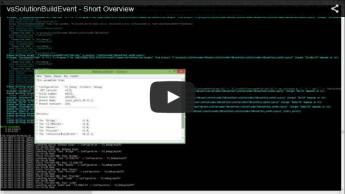 Samples for vsSolutionBuildEvent: Math operations, Date & Time, Operations with strings, etc. TheSBE-Scripts - it is our engine for additional work overMSBuild - conditions, subcommands, files, etc. by components. 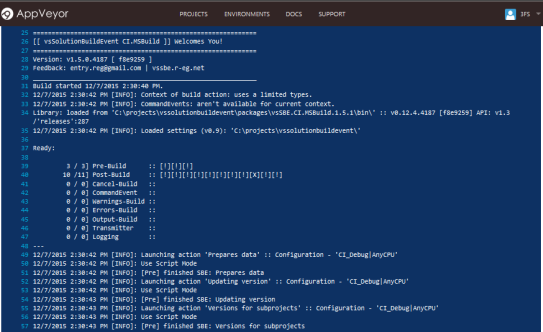 You can work with MSBuild Targets / Tasks etc. 'as is' (classic compatible mode). Visual Studio + MSBuild Tool: Don't forget aboutafter.<name>.sln.targets features if you only want action for all projects at once. Just call it from this mode.Read here. You can also choose this as action type. Control all of what you want and as you want. 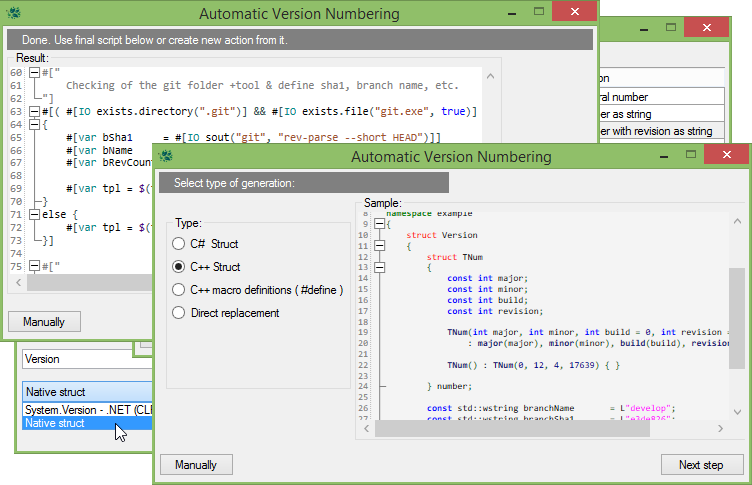 Available wizard for automatic code generation and a lot of custom variants. From basic variant as simple caller with external logic and scripts for any interpreter such as php, python, PowerShell, Wscript, Node.js, etc. 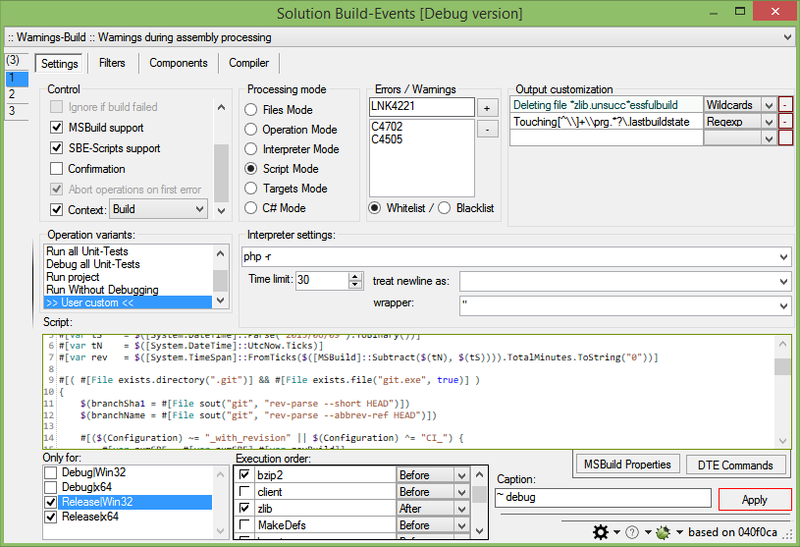 - to complex internal scripting with MSBuild & SBE-Scripts engine etc. Select "Stop building" in the"Operation Variants"
Wiki - Contains help for work with plugin, basic examples, syntax, informationfor develop, and other..
Feel free to improve any our pages. Click [Edit] button or Start new here. If you found errors or if you have some patch for our source code: please use pull request or send directly as.patch file.